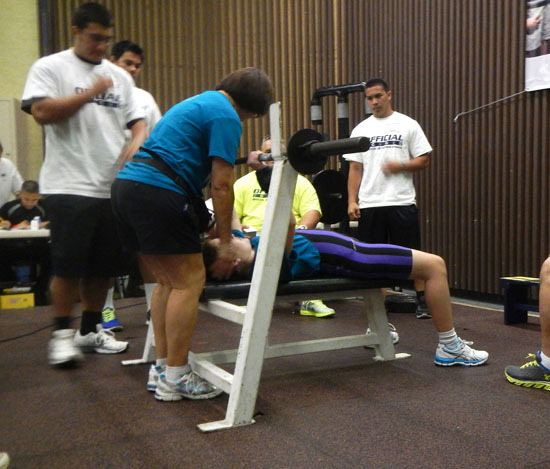 Denise Lindsey, head coach of the West Hawaii Powerlifting team, shares more than time and energy with her athletes. Lindsey gives with an aloha spirit. With Lindsey’s gift to her athletes, the organization keeps running. Despite the organization’s activity in the community, Lindsey said the public still has misconceptions about the Special Olympics. For example, she said people often ask her when Special Olympics starts. She hopes the more the community is aware of what the Special Olympics does, the more the community will be involved. Those smiles often help turn the athletes into their own best advertisements. The heart of the organization, however, is the partnership between athletes and people like Lindsey. When Lindsey coaches her athletes, her eyes are her most powerful tools. As she focuses on one athlete, her peripheral vision catches the lifts of other team members as they practice. And if she sees improper form, she immediately corrects the technique. To the pedestrian viewer, it may seem as though Lindsey has a sixth sense. But her intuition has grown with years of training. Lindsey started powerlifting competitively in 1986. At her first Hawaii state meet, she won her weight division and overall lifter. She held the Hawaii women’s record for 15 years and she is currently the state women’s record holder in the Masters Division. Still, making sure every athlete practices and competes safely can be a challenge. “Safety comes first because every body is different. If I lift one weight, it doesn’t mean that the next guy is going to be able to lift the same weight. So, what’s good for me is not necessarily good for you,” Lindsey said. The last time the team was on the map was in 2007, when Lindsey was chosen to be the assistant coach for the Team USA World Games in Shanghai, China. She joined her West Hawaii powerlifter Ray Donager and Leanne Ngai, a lifter from Oahu. Donager won three gold medals and one bronze and Ngai won four gold medals. However, even then, the media didn’t sufficiently cover their success. The Ironman World Triathlon Championship overshadowed the news from Shanghai. There’s no question that Lindsey can achieve her goals with the team. She has been dedicated to her athletes from the start. She first heard of Special Olympics at the Keauhou Canoe Club. While paddling, a fellow member told her that there was a special paddling event that involved children and people with developmental disabilities of all ages. She has also used her public relations skills from her experience in radio, print and television to get athletes involved in community triathlons and local 5 and 10 k runs. Lindsey was a mentor with the Global Messengers program, which pairs a trained public speaker with an athlete to work on communication skills. 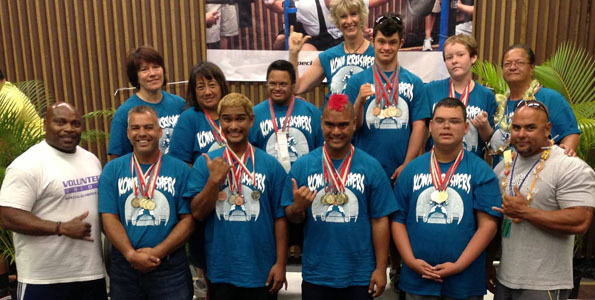 The program no longer exists in West Hawaii, but Lindsey argues it plays a major role in the success of the Special Olympics and its athletes. She would like to see Global Messengers revived in West Hawaii. Those who get involved in the Special Olympics don’t only teach and share. They learn from the athletes. There are two main qualities Lindsey said she has learned from her years involved with her athletes: unconditional love and patience. Lindsey’s athletes treat her with respect. They listen and learn. They want to grow. 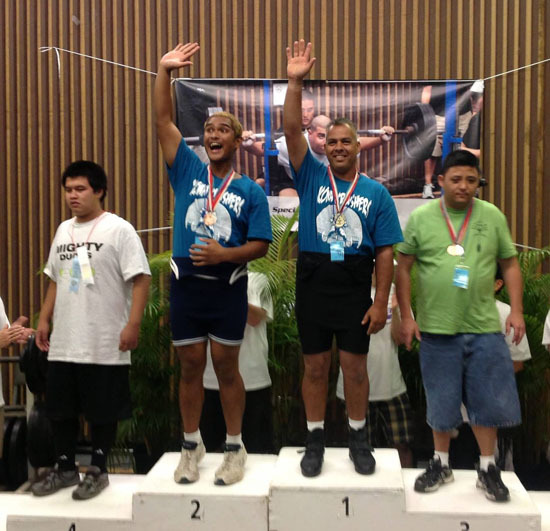 At the recent 45th annual Hawaii State Summer games on Oahu, the West Hawaii powerlifters dominated in their events. They brought home the most gold and over-all medals. Competing with approximately two dozens other athletes from across the state, the eight West Hawaii athletes brought home 16 gold, six silver, four bronze, and four fourth-place medals. Lindsey pointed out that Isaiah Wong proved his “world contention” strength on Oahu. She has been able to nurture athletes with competitive numbers. But Lindsey does not measure her athletes’ success by the way they compare to others. What she calls important are the changes her athletes make in their bodies and in their confidence. Lindsey’s optimism and careful coaching are not all that attracts her athletes to her team. Lindsey said her assistant coaches and support team at The Club in Kona make the difference in molding her athletes into a winning team, as well as encouragement from The Club’s other clients. Lindsey’s dedication to her athletes and sport isn’t left at the gym door. She decided to join her athletes at the Summer Games instead of staying in Kona for her father’s 75th birthday party. Lindsey said her dad understood her decision and agreed the gold, silver, and bronze that the team brought home was a great gift. My hat is off to you Roya. This is a beautifully written piece. You captured the real meaning of Special Olympics and brought it to life with the story of an amazing coach whose work exemplifies the true spirit of a great organization. From a big fan of Denise Lindsey and her “Krushers” team, mahalo for sharing with the community!